100% up to $800 welcome bonus. Little action at 7 Card Stud. One of the most popular online gaming brands in the EU, 888 Poker provides players with excellent online poker promotions, a generous loyalty program, cross-platform compatibility, and plenty of great features. 888Poker.com has a long history of providing secure and reliable online poker services to players throughout much of the world. At 888Poker, players will find an extensive tournament schedule, many varieties of Sit and Gos, and plenty of cash game action at NLHE and PLO. New players may qualify for a 100% 888 Poker bonus of up to $800 with our exclusive 888Poker promotion code. The online poker software, provided by 888 Holdings, is fully loaded with all of the standard features, plus a few unique functions. The 888 Poker download is available for PC users, while an instant-play version can be played on Mac, Linux or Windows systems with a flash enabled browser. 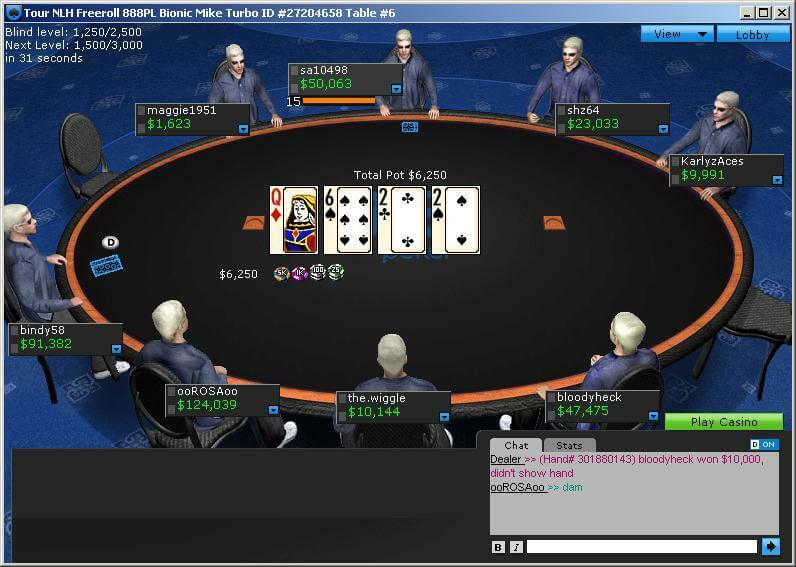 One of the most unusual features at 888Poker are the PokerCam tables, where players can literally face-off against their opponents with real-time web cam video at the tables. What’s more, the 888 Genie may instantly and unpredictably appear at any of the PokerCam tables with a mini game challenge for the players, awarding instant cash and other prizes. 888 Poker also displays a status progress bar to show players how close they are to reaching the next status level, or a bonus bar when the player is clearing a 888 Poker bonus so players will see how close they are to releasing the next installment of their bonus. 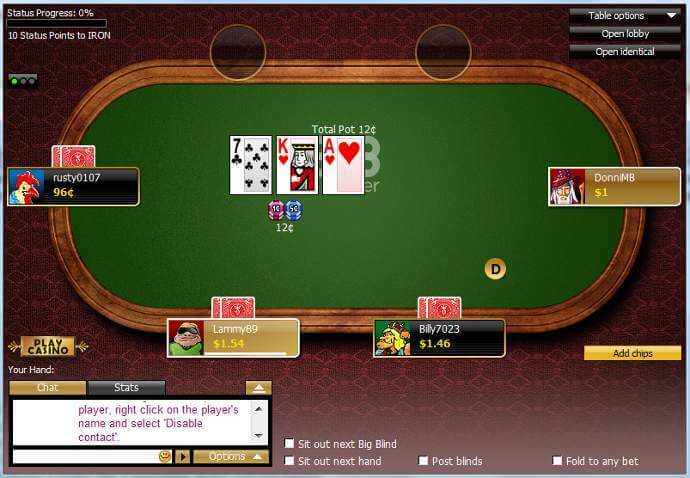 For muliti-tablers, there is an Open Identical button that players can use to open a table of the same stakes and game type in a new window. Only a handful of online poker networks can claim higher daily traffic scores than 888Poker. Despite hosting the traffic of less than ten online gaming sites, the 888 Poker Network boasts thousands of players even at off-peak hours. The cash game traffic is most heavily concentrated in the No Limit Texas Hold’em games, with a substantial number of players active at the Pot Limit Omaha, Fixed Limit Hold’em and Pot Limit Omaha Hi/Lo tables. However, the No Limit Omaha and 7 Card Stud receive considerably smaller interest at 888Poker. 888Poker features an extensive tournament schedule, including regular daily and weekly tournaments, guaranteeds, turbos, satellites, teams, and other special tournaments. 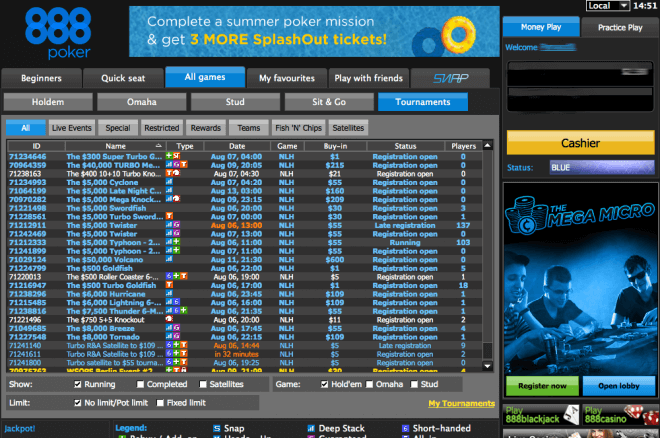 Omaha lovers will also find a selection of guaranteed NLO, PLO and PLO8 tournaments available daily at 888Poker.com. There is also a tremendous variety of Sit and Gos at 888Poker, including Turbo, Super Turbo, Double or Nothing, All In SNGs, and PokerCam tournaments. The Sit and Gos are available in either Hold’em or Omaha games, with buy-ins ranging from $0.02 to $2,000. Players will find a standard game selection at 888 Poker. The poker forms include No Limit and Fixed Limit Texas Hold’em, Pot Limit Omaha, Pot Limit Omaha Hi/Lo, 7Card Stud and 7 Card Stud Hi/Lo. Those looking specifically for Stud cash game action, though, will be hard pressed to find it at 888 Poker. Providing a full suite of online gambling products, including online poker, casino games, and sports betting, 888Poker receives a great deal of traffic from players who rely more on gut feelings than strategy. This results in a relatively high concentration of soft competition at 888Poker. In collaboration with 888Poker, Poker.org is able to provide new players with the most valuable 888 Poker promotion code for up to $800 in bonus cash with a 100% first deposit match. This 100% 888Poker bonus can be activated by entering our exclusive 888Poker promotion code FREE888 at the cashier when making your first deposit. The 888Poker.com bonus will be released into the player’s account in $10 increments for every 100 Bonus Points earned in real money online poker games or certain casino games. Players can track their progress with the built-in 888 bonus meter above the tables. In addition to the 100% 888 Poker bonus, new players will also receive entry to $100,000 First Depositors’ Challenge, the $1,000 Depositors’ Freeroll, and seven $500 First Depositors’ Freerolls as part of 888Poker’s Welcome Package. 888Poker rewards player loyalty with cash and merchandise in a tiered VIP program. As players participate in real money cash games and online poker tournaments at 888poker.com, they earn Reward Points and Status Points. The number of Status Points a player earns in a month determines that player’s status level for the following month. At the beginning of each month, the Status Points are reset, and the cycle begins again. The status level a player achieves dictates the number of Reward Points 888 Poker issues for each $1 paid in rake and tournaments entry fees. The Reward Points are carried over to the next month, and may be used to purchase items from the 888 online store, or exchanged for cash. In addition to the generous welcome bonus and loyalty program, 888 Poker features numerous online poker promotions including freerolls, leaderboard challenges, and live event prize packages. Monthly bonuses, team tournaments, and big money guaranteed prize tournaments also add to the fun and entertainment at 888Poker. Players at the 888 PokerCam tables may receive cash or other prizes when the 888 Genie suddenly appears to engage players in a variety of mini games. New players can enter the $100,000 First Depositors’ Challenge, where the top 10 players win entry in the $100,000 Sunday Challenge. Customer support is provided at 888Poker via email only. Deposits: Visa, MasterCard, Visa Electron, Delta, Bank Transfer, CashUp, ClickandBuy, Chinese Debit Cards, Commerzbank, Deutsche Bank, eNets, Entropay, Laser, Neteller, Netpay, PayPal, Pay&Play;, PayBox, Postepay, Kalibra, Moneta.ru, Skrill (Moneybookers), WebMoney, Qiwi, eWire, Abaqoos, Boleto, Dankort, Diners Club, eKonto, Giropay, iDeal, PayPoint, Nordea, Przelewy24, Paysafecard, POLi, SEB Pank, Sofort, Swedbank, Ukash, FundSend, DineroMail, LobaNet, Fast Bank Transfer, Instant Banking, InstaDebit, Multibanco. Cash-outs: Visa, MasterCard, Visa Electron, Delta, Bank Transfer, CashUp, ClickandBuy, Chinese Debit Cards, Commerzbank, Deutsche Bank, eNets, Entropay, Laser, Neteller, Netpay, PayPal, Pay&Play;, PayBox, Postepay, Kalibra, Moneta.ru, Skrill (Moneybookers), WebMoney, Qiwi, eWire, Wire Transfer, Bank Draft, WebMoney.